This summer I was overcome by a full on blitz of crazy jam energy. The family hit every farm within 10 miles of us (which is like 15) and we picked and picked and picked fruit until it was coming out of our ears. So ostensibly, if being sustainable means never having to buy jam again (and never saying we’re sorry about it), we’re there! Here’s a little peek inside our pantry. This makes up just a fraction of what we put up. Check out the cute little bows and charms. A nice little touch for a gift. To be totally sustainable I should have tied some decorative grass on it but hey, that’ll be another thing I only do when I absolutely have to. 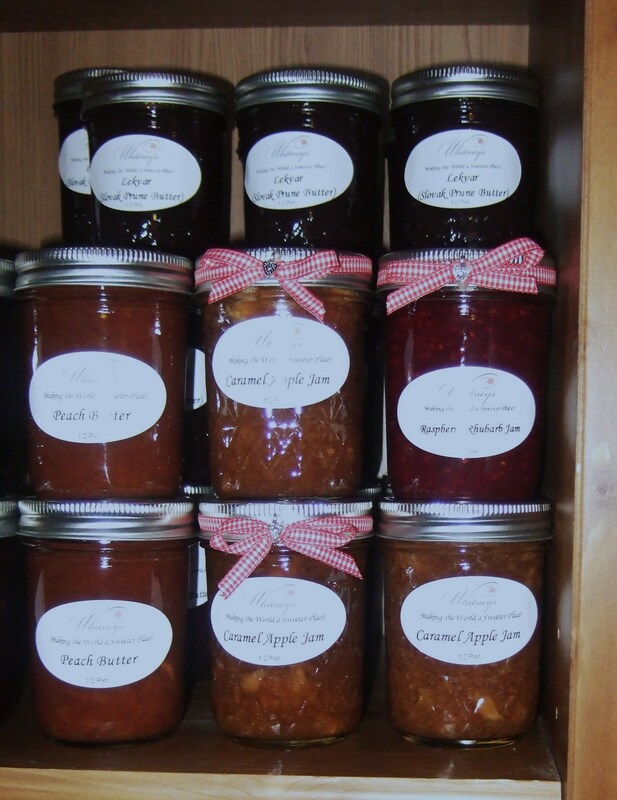 This summer I made Peach Butter, Slovak Prune Butter (what can I say, it’s what my people eat), Apple Butter, Strawberry Rhubarb Jam, Spice Blueberry Jam, Raspberry Rhubarb Jam, Italian Plum Conserve, Blackberry Kiwi Ice Cream Topper, Mixed Berry Syrup, Pear Butter and Caramel Apple Jam. This fall I’ll add Pumpkin Butter and Concord Grape Jam. One of the biggest hits was the Pear Butter! Check it out. Combine pears, wine and lemon juice in a heavy sauce pan. Cover and simmer until pears are soft, about 20-25 mins. Push through food mill or coarse sieve to remove skins. Transfer to food processor and puree. Return to heavy sauce pan and add remaining ingredients. Stir over low heat until the sugar dissolves. Increase to med. heat and boil gently until mixture thickens and mounds on spoon. Stir often, this will take about 50 minutes. Discard fruit slices, cloves and vanilla bean. Spoon butter into hot canning jars, filling only to 1/4′ from the top. Wipe rim of the jar and place lid on. Seal tightly. Arrange jars in boiling water in your canning kettle so that at least 1″ of water covers the jars. Cover and process for 15 minutes. Remove jars from the pot and cool. If the top seals, they will last for 1 year in a cool dark place. If the lid pops up, refrigerate and use… or barter from some fresh meat that you won’t have to kill yourself! Now if I can just throw myself into sheep shearing with the same enthusiasm I can learn how to spin yarn so I can knit some warm sweaters. Stay tuned.